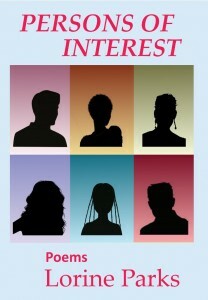 Persons of Interest, the latest collection of poetry by Lorine Parks. Los Nietos Press is proud to announce the publication of Persons of Interest, the latest collection of poetry by Lorine Parks. Parks is a prolific writer who finds subject material in daily events and news stories. Although she studied classical literature, her first published book, Catalina Eddy, was fanciful personification of the many manifestations of Southern California weather in the form of a mafia family. For her latest collection she draws on her classical roots, but also from her many years as a professional travel consultant, to explore fascinating individuals throughout history, and to weave a woman’s perspective to this expansive cross section of life. 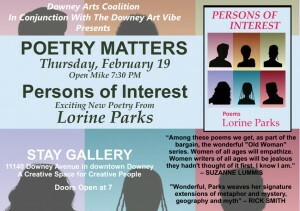 Lorine Parks will be the featured reader at POETRY MATTERS, the monthly poetry reading that she curates at STAY GALLERY. Her reading will take place on February 19th. Doors open at 7:00, open mike begins at 7:30.